Optimal store performance begins with an accurate plan. Our Sales and Labor Planning™ solution leverages the data from the Enterprise Labor Model™ to produce an objective and accurate bottom-up weekly labor budget, weekly and daily sales and volume forecast, and staffing for service departments at 15 minute increments. Logile’s workforce planning solution has unique features that help us better plan our labor scheduling and as a result has helped us to control our labor costs. Uses historical item movement, engineered standards and store/department specific characteristics to produce a work content based labor budget that replaces less accurate planning based on sales per payroll hour, items per hour, fixed and variable hours and labor percent. Provides multiple forecasting algorithms, and a workbench to set up the appropriate algorithms based on seasonality, holiday and other events. Robust algorithms includes forecasting utilizing pre-determined attributes, that distinguishes promotional versus non-promotional items. Attributes included in the promotional item algorithm include type of sale, type of advertising, ad theme, special events, as well as your individual attributes. Provides industry leading forecasting algorithms that forecast sales within 2% of accuracy. Generates labor plans at multiple time intervals, including annual budgeting, period projections, weekly and daily forecasts. Some departments can be as detailed as 15 minute intervals. Rolls up detailed plans at sub-department level to the chain and at every level in between. Provides extensive “what if” analysis to allow you to see the impact of changes in work methods, new marketing initiatives and other adjustments. Lets all levels of users in your organization work interactively to review and approve labor plans. 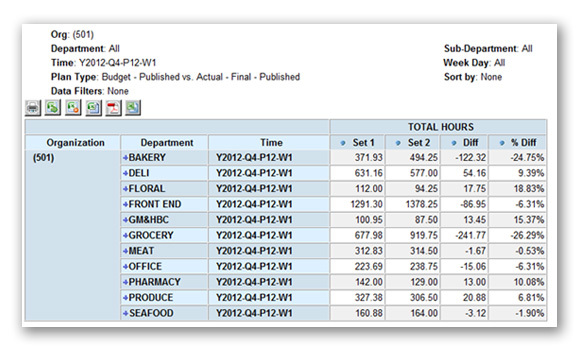 Gives store and department managers valuable insight into how to schedule both fixed and variable hours. Integrates seamlessly with our Wall-to-Wall Labor Scheduling solution or your existing scheduling system.